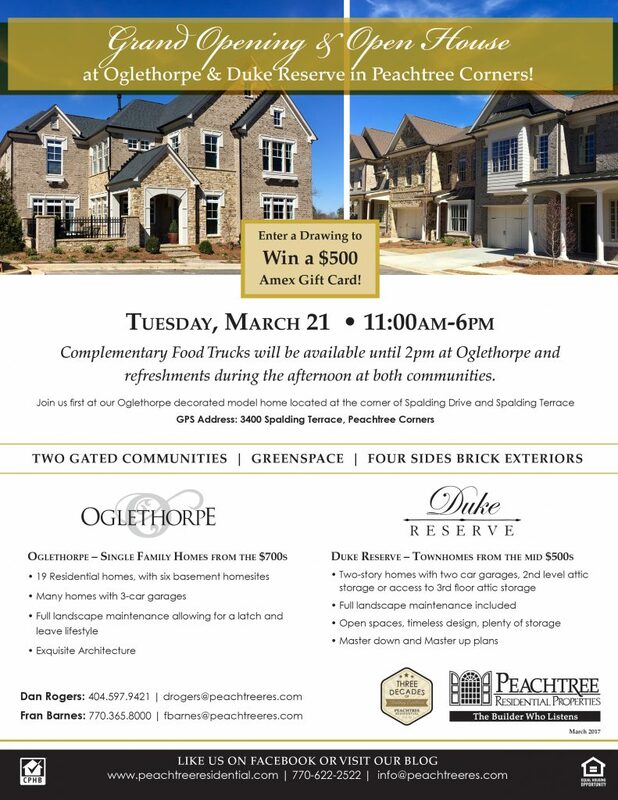 The Grand opening of the new home communities in Oglethorpe and Duke Reserve in Peachtree Corners was March 21st, 2017. Gwinnett’s newest city, Peachtree Corners, is home to two new residential communities. 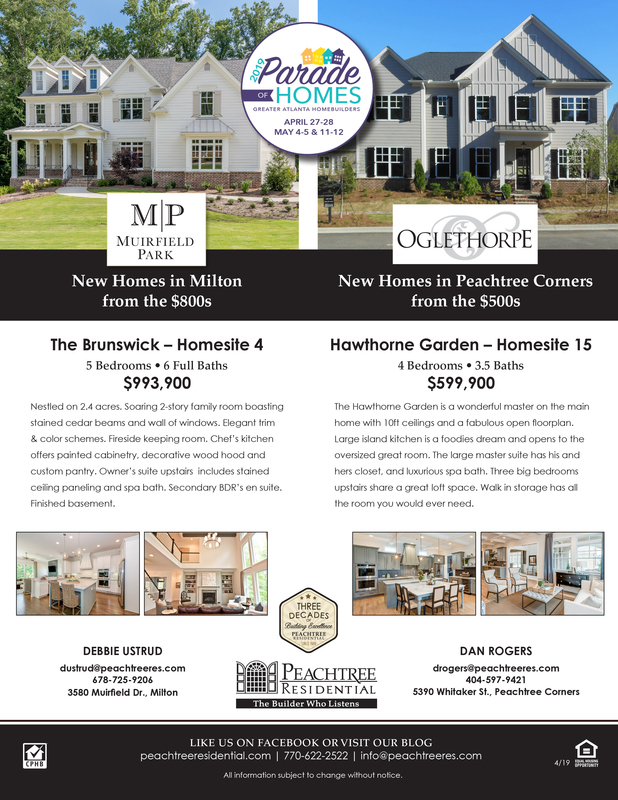 Peachtree Residential Properties, unveiled the model homes for Oglethorpe, a single-family home development and Duke Reserve, a luxury townhome community. Both developments are on Spalding Drive. 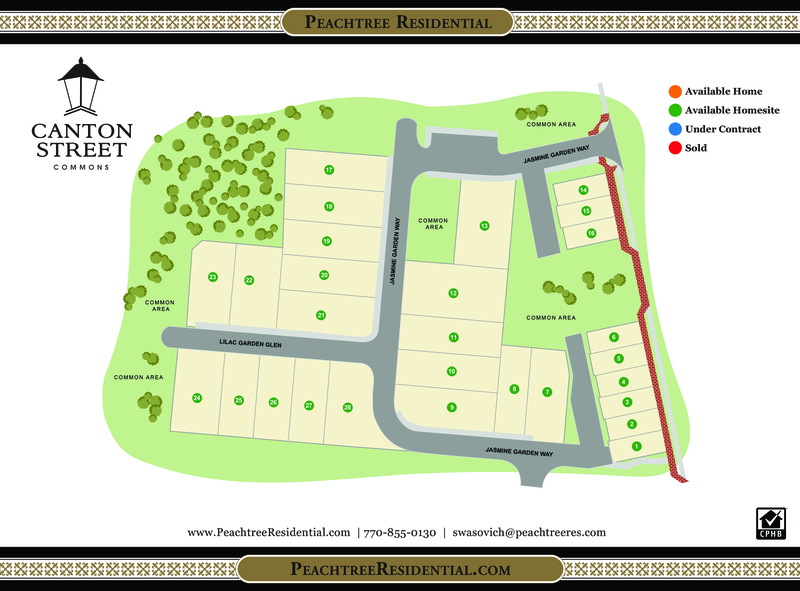 Oglethorpe is adjacent to Wesleyan School, Duke Reserve is across the street from the Peachtree Corners Post Office. 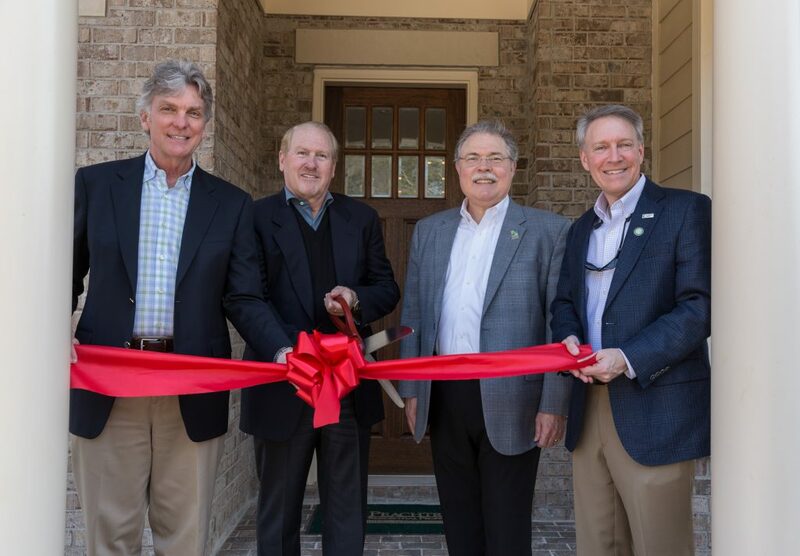 More information on the new home communities can be found here: http://www.peachtreeresidential.com/ The Council member Weare Gratwick and Mayor Mike Mason were able to attend the Grand Opening and join the Peachtree Residential CEO Dave Borreson and President Alec Rickenbaker. Exciting news is happening at Peachtree Residential. Next Tuesday, March 21st , 11am-6pm, we will be having a Grand Opening Event showcasing our two beautiful new Peachtree Corners communities. There will be a $500 American Express gift card drawing, complementary food trucks for lunch (11am-2pm) and refreshments. Our Oglethorpe neighborhood will be home for 19 families seeking a convenient location, the security of a gated community, and some spectacular new single family floor plans. With both master up and master down plans, this neighborhood also includes yard maintenance for a carefree lifestyle. We have three inventory homes nearly finished as well as a professionally decorated model home. Duke Reserve will also afford a great Peachtree Corners location to 25 lucky homeowners. Duke Reserve provides the comfort of a gated townhome neighborhood with the ability to live a lifestyle free of maintenance. All of this while enjoying the many comforts of these three brand new floorplans, including a first floor master design. Our furnished model will be opening in early April but we currently have three homes ready for immediate occupancy and three more that can close in April. We truly hope you are able to join us next Tuesday and see for yourself what all the excitement is about! 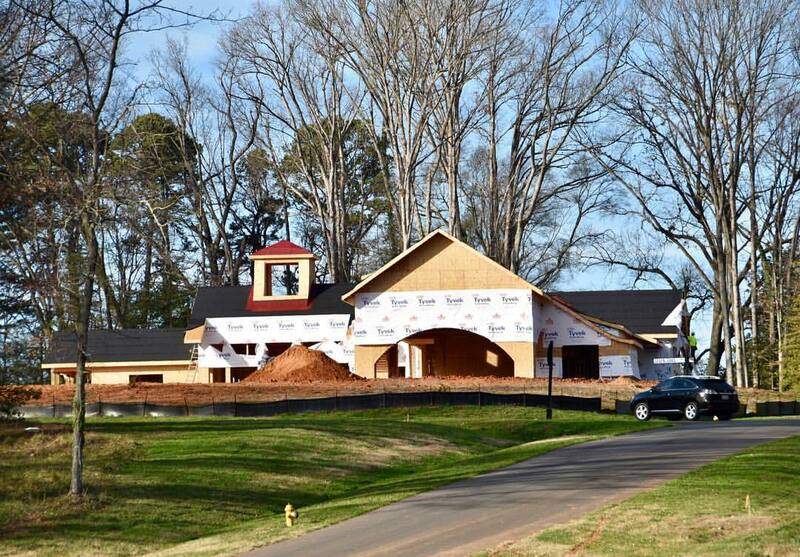 Check out the progress underway in the Kristen Lake community off Providence Road in South Charlotte. Our decorated model will be open soon! Kristen Lake, Peachtree Residential’s newest South Charlotte neighborhood represents the latest thinking in both community design and architecture for this infill location. The 4.2 acre site is master planned for an enclave of 9 detached single family residential homes. The homes are meticulously designed to reflect the rich architectural details reminiscent of the Georgian style. The homes range in square footage from 3,200 to almost 5,000 square feet. Many of the homesites feature exceptional water views of pristine Kristen Lake located immediately adjacent the property. The neighborhood offers both basement and crawl space homesites. The lake front basement sites allow for optional additional finished spaces for a true lake orientation. Homes are designed with front and side entry garages, many with 3-car. There is an emphasis on pedestrian scale at Kristen Lake including a feature in the center cul-de-sac and a decorative brick sidewalk system throughout the neighborhood. There is a community walking path to a passive park with a seating area overlooking the lake. The walkable design includes themed home elevations, gas lanterns, brick pavers, porches, trellises, brick walls, and exquisite landscaping. Click here to view the community site plan. 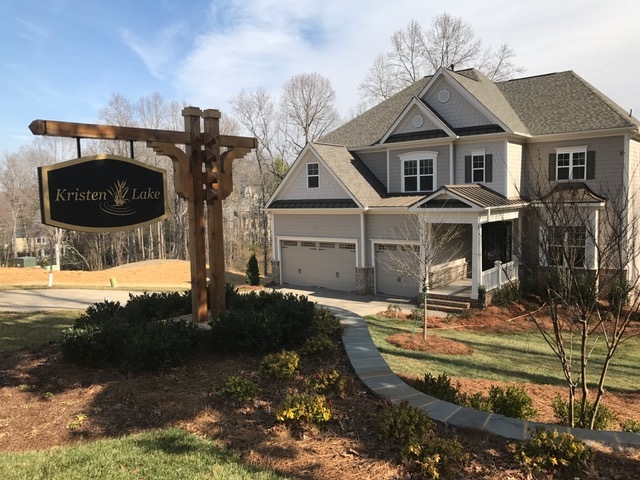 Kristen Lake’s unique location at Lakeside & Providence Road allows for quick access to Uptown, Myers Park, Arboretum, South Park, and I-485 to Ballantyne. Email Addie for more info or to schedule a preview of our new model. While visiting, be sure to visit the Peachtree Residential model home located at 200 Seven Oaks Landing just off of Armstrong Road. Looking for a superior builder and exquisite craftsmanship along with a great location close to walking trails and local nature? 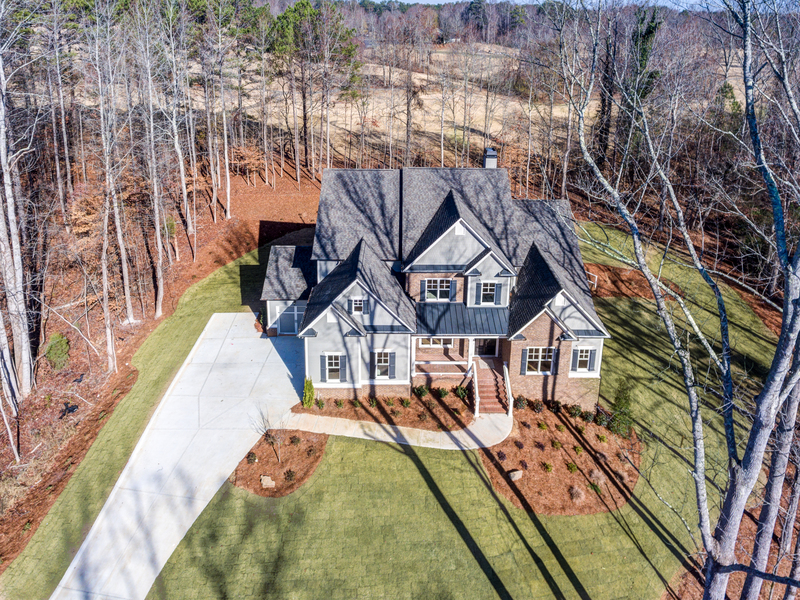 Well look no further, Peachtree Residential is a new homebuilder with communities in Fulton and Forsyth Counties where you will find the Big Creek Greenway offering activities for all ages. Fulton County communities include Canton Street Commons and Ruth’s Farm in Alpharetta. Milton offers The Hampshire’s, Hickory Crest and Murifield Park. Peachtree Residential also has one new home community in the city of John’s Creek and has large estate homes in Shakerag Manor. 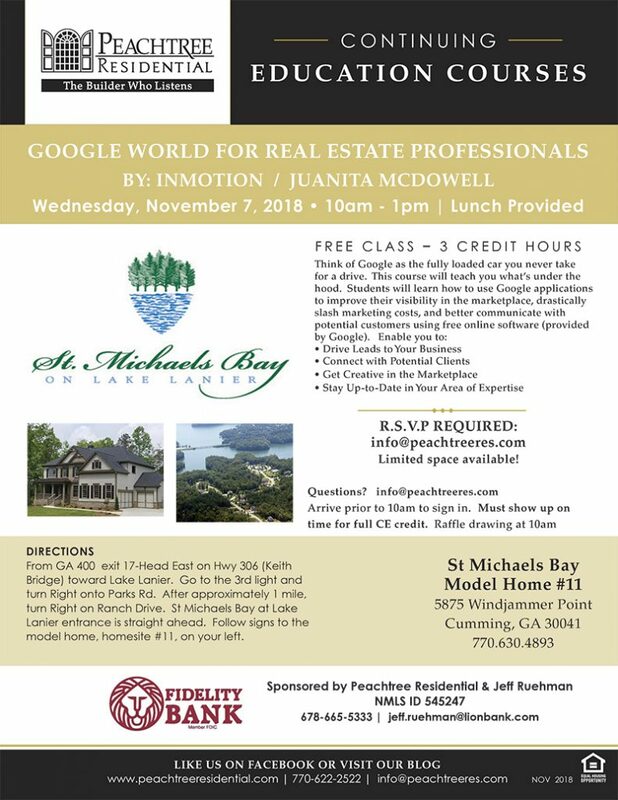 If Forsyth County is your area of interest we offer 2 communities, St. Michael’s Bay and Westbrook. Westbrook has one final new home priced at $499,900 and the neighborhood is full of amenities. St. Michael’s Bay on Lake Lanier is a gated community with new homes priced from the $400’s-$700’s. Living close to the Greenway gives you no excuses to get out and enjoy nature! 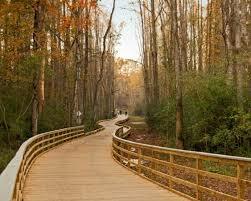 The Big Creek Greenway has two trails split between for Forsyth and Fulton County. Whether you walk, jog, bike or rollerblade along the scenic route there’s something for everyone to enjoy on the wonderful Greenway! Click here to check out more information here on the Big Creek Greenway!